We need to ask Shawyer as maybe a typo. Maybe Mulletron can ask him as he has email contact and the data is in the public domain? Imagine EW testing his portable EMDrive demonstrator. That would make my day. Q of 45,000 is impressive. I don't think that we can dismiss this as a typo (and therefore I agree with you that it should be pursued with a question to Shawyer) because in a previous discussion in this thread I had addressed this question to Star-Drive, who answered that as far as he knew there were two ways to change the direction of thrust of EM Drives: a) to change the location of the dielectric polymer insert and b) to change the mode shape. Star-Drive posted his experimental evidence for a) and wrote that he had no experimental evidence for b) which (to my mind) means that this is information he may know from other experiments. We know from the 2014 summary that there was no dielectric in the Demonstrator. From the SPR site data on the Demonstrator Engine we know it can alter it's cavity length to assist tuning but that should not alter thrust direction. What now seems clear is dielectrics can generate thrust in a static device and in the opposite direction to a classic EMDrive. That should tell us more about what is going on as in classic Shawyer EMDrive it must move to gen thrust and with just a dielectric in a tuned pipe (Cannae test device minus the cavity) we should get thrust without movement. Very different effects going on here. This matches with what Shawyer said in his email that dielectrics, in a classic EMDrive, increase losses and reduce Q. Dielectric generated thrust, in the opposite direction, would sure do that. So far, no mode change can reverse direction w/o dielectric in the cavity. Still working on it, but the reflection from the dielectric surface and the dielectric properties vs frequency are the relevant parameters. 90 seconds of thrust at 326mN/kW over a power input range of 150w to 450W is not something that is hard to test for. SPR say they built & qualified this Flight Thruster for Boeing. So where is it? Why don't EW have it to test? My recollection is that it was earlier reported in these threads that Boeing decided to discontinue any further work on it. Do you have any further (or different) information ? Concerning Eagleworks working with Shawyer, Eagleworks is already under severe budget constraints, for NASA to enter into an R&D agreement with a foreign company pursuing intellectual property rights is not a trivial endeavor as it would require IP negotiations and agreement from NASA's IP department, so that is fully understandable. 1. if the pendulum that measures the force is made of metal, is it properly shielded from electro magnetism? 2. why, in the second run there was much less thrust? (this was an experiment where more measures were taken against confounding variables, so does the drop in thrust indicate any confounding variable to have played a major role in the thrust measured in the first experment? ...Nobody here is addressing the frame problem either. I am not addressing the frame problem at this point in time because I think it is very premature to deal with future applications (for which the frame problem I agree is indeed important to address) when we are still discussing the experiments and the working theory. Can you address the frame problem for self-accelerating particles (shown to be a valid solution of Schrodinger's equation, for at least 36 years) ? Yes I know of the Boeing reports. As Shawyer said in his vid, "It Went Dark". Boeing/DARPA provided a SFE (Serrano Force Effect) device to EW to test (lower left attached image). Which they did and EW reported thrust. Seems fairly easy for Boeing to send a SPR Flight Thruster to EW to test? Interesting EW shows the SPR Flight Thruster and calls it "High Fidelity". So why not test it? ... Seems fairly easy for Boeing to send a SPR Flight Thruster to EW to test? No, NASA cannot just "accept" a SPR Flight Thruster to test just like that, when SPR is a foreign company pursuing intellectual property rights. Even Ford Motor Company will not accept any letter from any inventor disclosing an invention and much less accept to test in their R&D department a rig from a company pursuing IP rights. It would need to involve an IP agreement. For item one i can help. It is not a pendulum. It is a torsion balance. Great pains have been taken to eliminate all sources of error including electromagnetic related effects or at least quantify them and deduct them from the data as much as possible. You cannot be sure though that there isn't some factor you have not thought of at work. But with all the scrutiny this is getting and has got you can be sure that the probability of some unknown but mundane source of error is pretty low. No, NASA cannot just "accept" a SPR Flight Thruster to test just like that, when SPR is a foreign company pursuing intellectual property rights. Even Ford Motor Company will not accept any letter from any inventor disclosing an invention and much less accept to test in their R&D department a rig from a company pursuing IP rights. It would involve an IP agreement. Except all the SPR tech was acquired by Boeing. So you are saying that if Boeing wanted to ask EW to test a Flight Thruster they had in their possession and was their paid for property, they could not do it? Surely Boeing can use other test labs to verify claimed performance? I mean Boeing did acquire all the SPR tech. Doubt they would do that without being sure it worked. Which implies it was tested and probably by several labs. 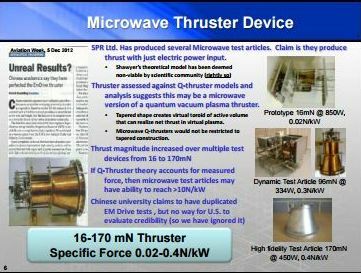 Note that EW calls the SPR Flight Thruster a "High Fidelity Test Article". Must mean someone has tested it and verified it works as claimed? Yes, based on my experience being in charge of R&D departments in private companies and managing Intellectual Property negotiations and litigation, I would expect that for NASA to test devices from companies pursuing intellectual property rights it would involve a negotiation of an IP agreement. The SPR/Boeing deal was done and dusted in 2010. Boeing sent the SFE device to EW in 2013. Doubt Shawyer could object to Boeing sending it to EW to test? Point being Boeing has a SPR Flight Certified EMDrive thruster in their possession. EW call it a "High Fidelity Test Article". EW has pictures of it. Yet they mess around with mosquito thrust EMDrive clones with embedded dielectrics, trying to get thrust in a static test rig. BTW I have talked to Serrano and know the history of that device and test run. It produced torque and not linear thrust. He has a newer linear thrust device that will be tested very soon. Are you saying SPR is currently pursuing Boeing for intellectual property rights? My info says the deal was done and dusted many years ago and Shawyer has moved on. You cannot address the theory without addressing the frame problem. And no I can't address the frame problem of the self accelerating particle. At least not from a verbal description. But I bet dollars to donuts that they can. If they can't their work is nonsense. Actually I doubt there is a frame problem involved. The center of gravity for self-accelerating particles cannot be defined, because the Airy function is not square integrable: it corresponds to an infinite number of particles, just like the plane wave and other wave functions in scattering theory. Both T-invariance and P-invariance are broken in this Schrodinger solution system, it does not admit a Lagrangian formulation. Great, but unless it behaves differently depending on what frame of reference it is in it isn't a frame problem. For example if it works differently on Mars than on Earth because of the different orbital velocity. Yes, the frame problem is very important, probably indicating the theories on how this works are incorrect. However, we are getting the cart before the horse. This theory controversy goes away if more precise, totally isolated from the environment, experiments are connected and no anomalous force is found. If there really is a force being produced, I'm confident that a theory can be developed that does not throw the past hundred years of physics out the window because current theory is extremely successful in describing the universe. Current theory is not complete, but we know it is not wrong.